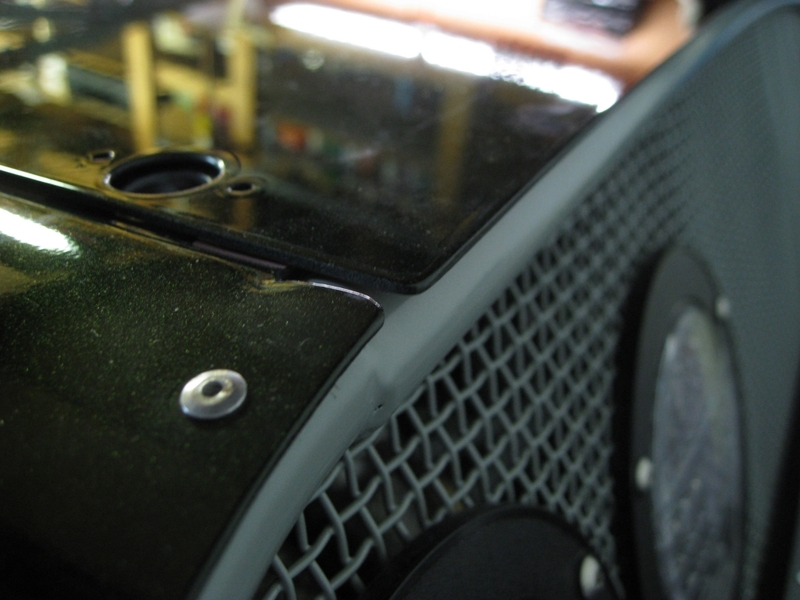 Mounted the intercooler inlet screen, which took longer than it should have because it wasn’t fully fit-up earlier. Also, either the chassis or aluminum panels seemed to have changed shape slightly after being powdercoated. 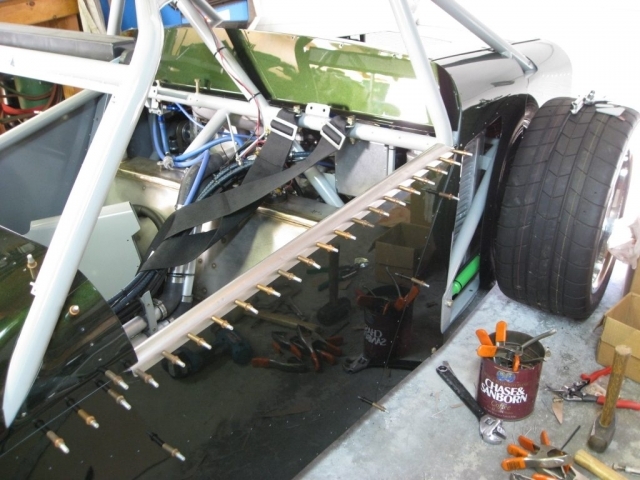 The panels were drilled then used as pilots to drill the chassis tubes, so all the holes did line up at one time. 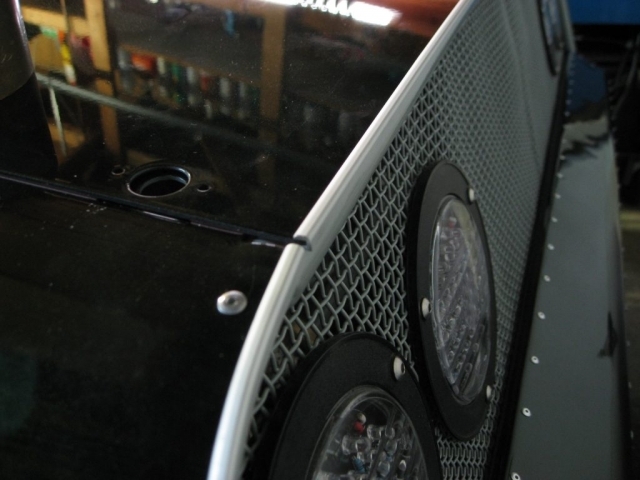 Additionally, Clecos were used to ensure the panel didn’t shift, so something’s changed. 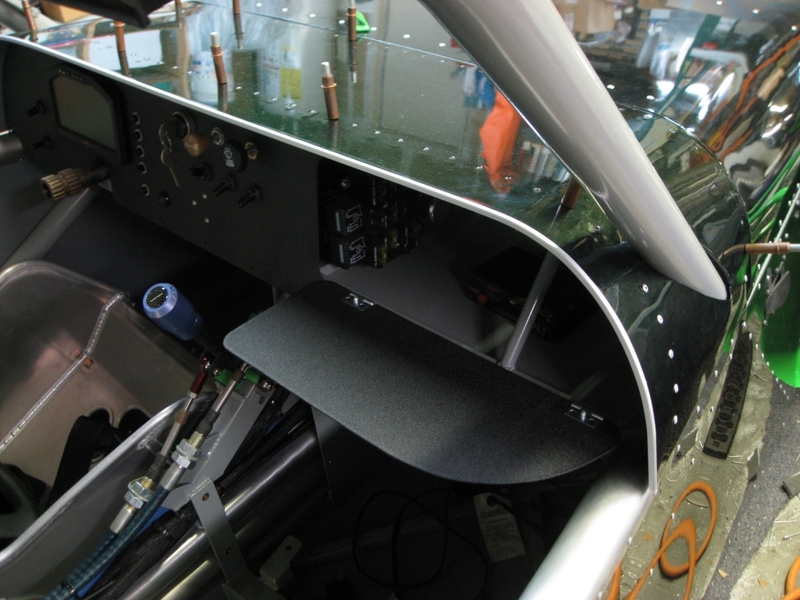 Of course, with rivets it doesn’t take much to be “off”; just a few thousandths of an inch will keep a rivet from seating. 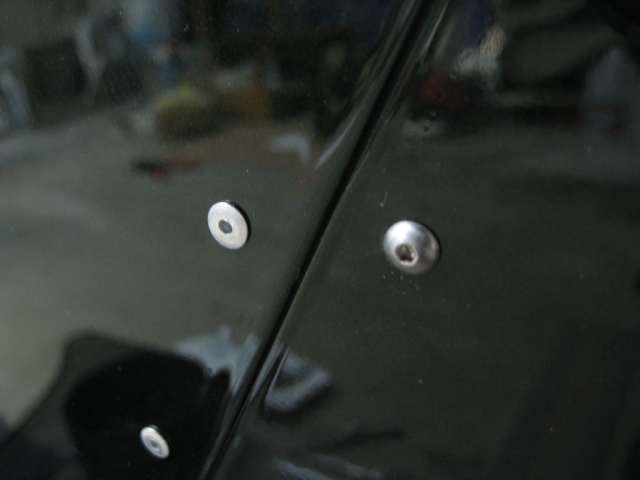 In any case the rivet holes have to be chased anyway since paint effectively under-sizes them. Even so, it unfortunately meant that some holes had to be cheated – elongated. 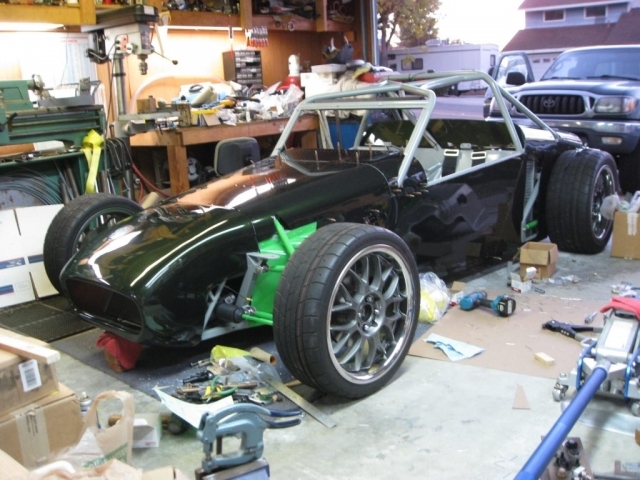 Not by much, but enough to be humbling as far as a so-called “precision” chassis goes. Rivnuts are kind of fussy for alignment – the screw has to be exactly aligned to avoid cross-threading them. As much of a nuisance as they are though, they do make panels removable without big obvious quick-release fasteners. In the first picture is the panel containing the intercooler grill – hard to tell that it’s not riveted in just like the panel at left, huh? Close up you can see how similar a 1/8″ rivet and a 6-32 button-head screw is. In the last picture is the rather ponderous rear fender in-place… it really changes the look of the car and I’m not sure it’s in a good way. Still, there may be little or no choice to run them; if they end up on the car they’ll “probably” be painted the bright lime-green instead of the dark green to aid visibility. We’ll see. Odds and ends. Replaced the O-rings in the cylinder head radiator hose adaptor due to it leaking. 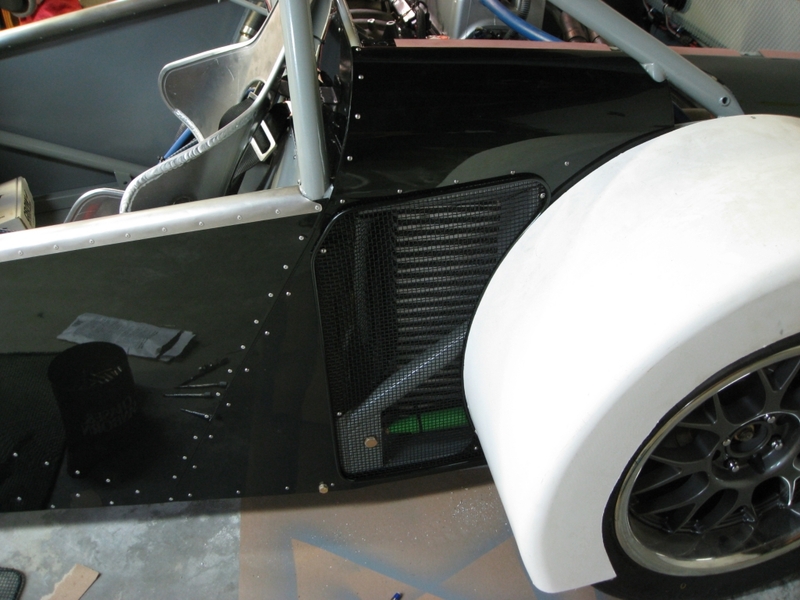 Then after months of searching, found appropriate aluminum extrusion that does wonders for the edges of the aluminum cowl as well as the rear edge of the engine cover. For now they’re just sitting in place until mounted permanently, probably with a couple carefully-applied drops of epoxy. The first and third picture is “without” and the second and last are “with.” And yes, that is a glove box you see there… still have to work out some sort of latch. Lastly, over the last year, people from 124 countries have visited this site… that’s simple astounding to me because it means that people from roughly 2/3 of all the countries in the world have visited here at least once. That’s just… wow. 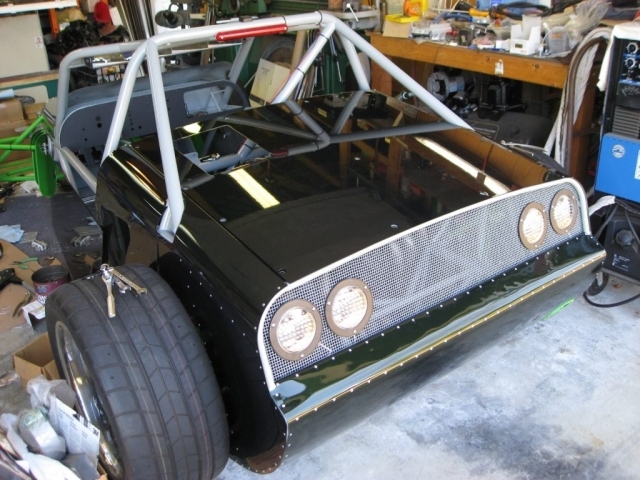 The fiberglass nose, front cover, and ribs were assembled into its complete hinge-up assembly. 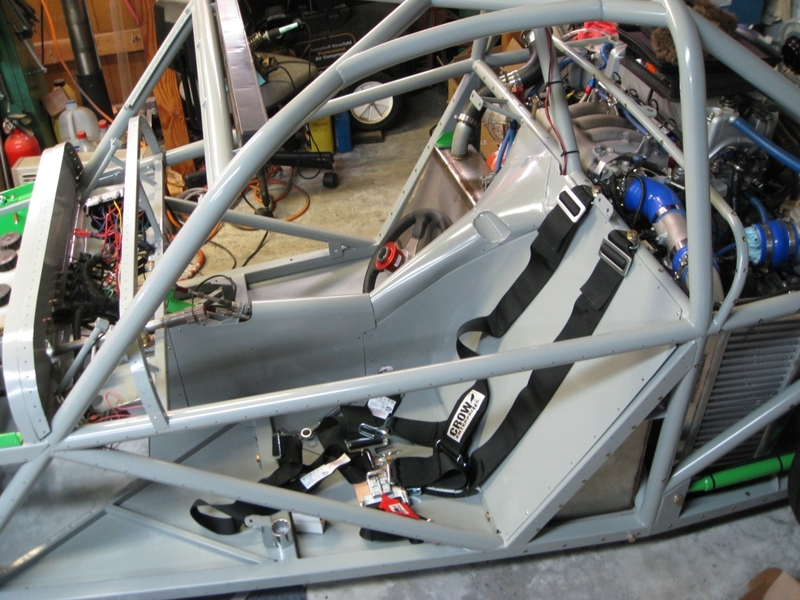 Then the side panels were permanently attached, the driver’s side firewall put into place and the seatbelts installed. 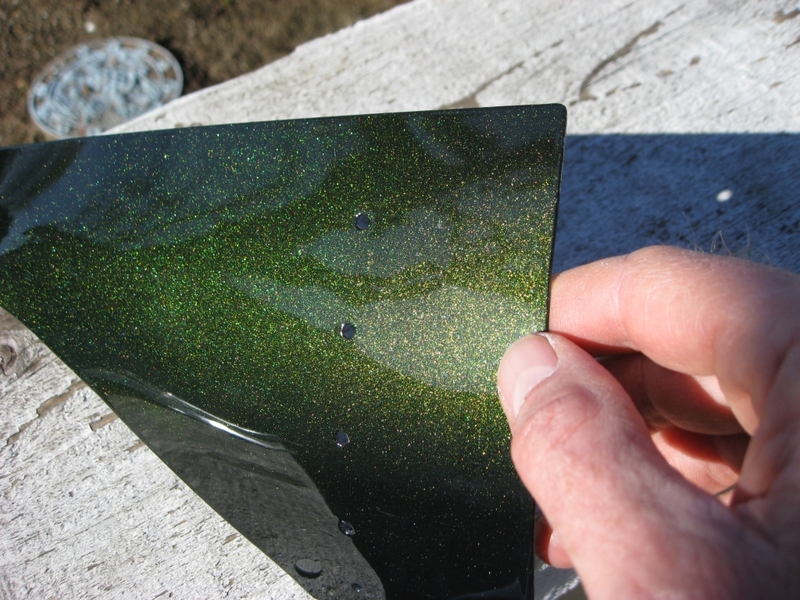 Thin stainless sheet was formed into wear-protection strips where people will be sliding in and out – may as well protect it right from the start as the paint would get scuffed fairly quickly. Even after all the panels are in there’s a nagging list of odds and ends, such as scaling the oil pressure sensor. It was done initially using the weenie air pressure gauge on my air compressor, so there’s no way it’s accurate and needs doing before any serious driving. As mentioned before the fuel level sensor still hasn’t been calibrated. However, the biggest irritation involves vehicle speed, which is calculated by the Honda engine computer and is already supplied in the data packet containing all the other system parameters, so what’s the problem? For some strange reason the flat dash manufacturer didn’t bother to parse speed out even though they have a speedometer! Asked about it they said that they would add it – that was two years ago. Now they say that to make it work will require all new hardware… seriously? There are two ways round it. Either use the GPS to calculate speed – which means there would be no odometer, or wire in a sensor of my own – which was the point of the flat dash, to not have to add my own sensors. Slowly working through the Materials chapter, listing what and how much of every component is required. It’s not much fun but has to be done. Lastly, a few people mentioned that – without the nose – how much the car looks like a 1930s-based hotrod, especially without the fenders. I attached the nose to the assembly with small screws which allows swapping it out for repair… or perhaps replacement with an aluminum nose that has more of a hot rod look. That’ll definitely be for later. And here’s the final missing piece, the nose! It sure changes the look of the car. Still much to do but the end is near. 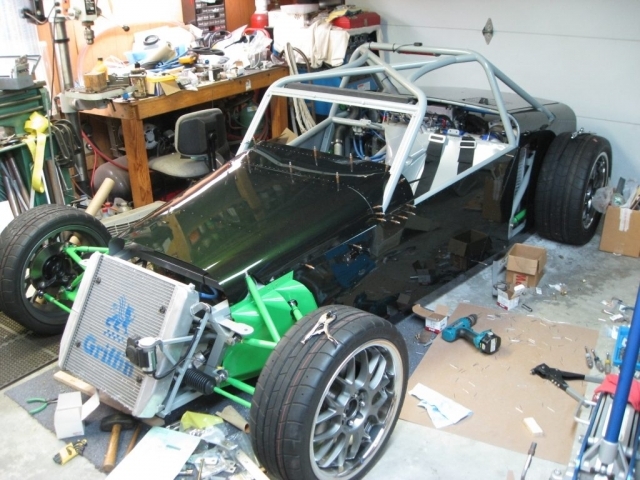 Like after a binge at a frat house, the garage is a mess, such is the single driving task of getting the parts on the car. Once that’s done there’ll be a major clean-up; I don’t like working in situations where I have to watch where I’m walking but that’s what happens when a single-minded goal is within sight. Later in the evening I was going over the manuscript… ugh. I see a lot of things that need additions or changes. Nothing huge but there’s a lot of work left to be done on that project. All the exterior panels except the nose were painted this week. 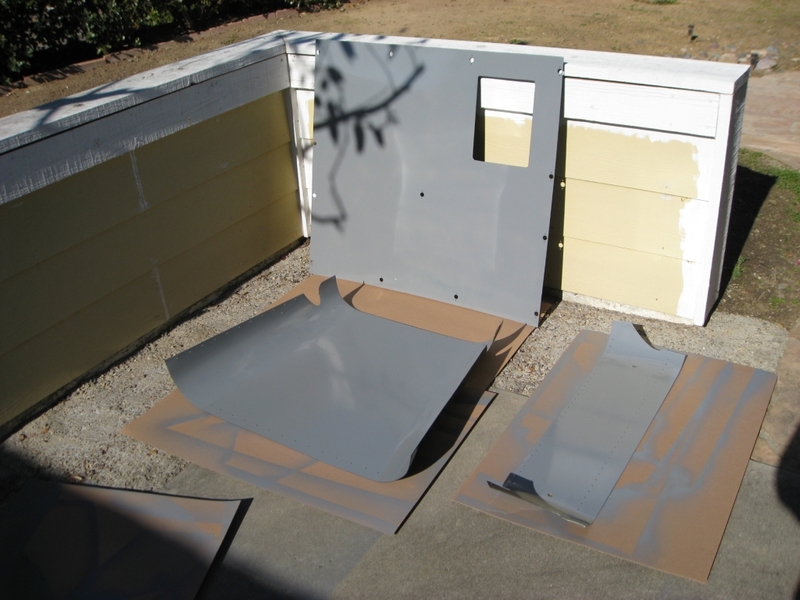 The goal for this weekend – because the paint shop couldn’t easily paint both sides of the panels – was to paint the opposite sides gray in order to make the panels truly look done, not as if, um, someone had painted them in their garage. That took a bit, masking off the painted side to make sure none of the overspray got onto the “good side”, then there was chasing every rivet hole before riveting on the rear-most panels. 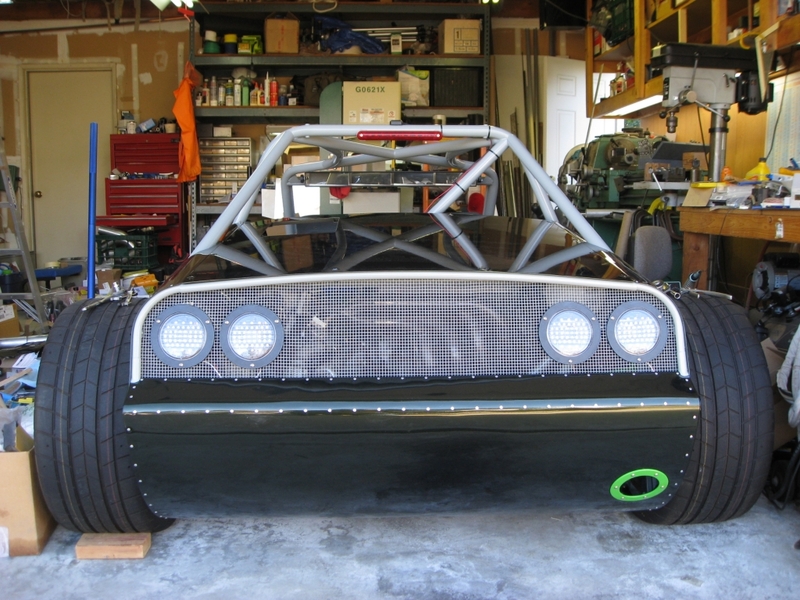 The real goal was to basically “store” the panels on the car, off the floor and away from me and my clumsy feet. Also, since the interior panel work isn’t complete yet, it’s easier to access them with the side panels off. 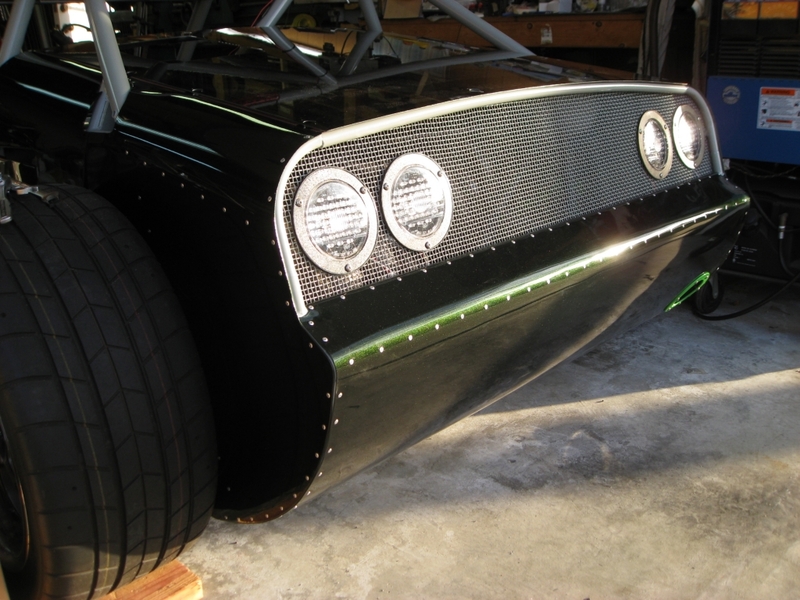 The front grill and side air inlets were both painted the exterior color in order not to draw attention to them. Haven’t decided whether that was the best choice for the nose but it’s easy enough to change later on. Related to that, the rear grill is presently gray and seeing it with the dark body panels makes me wonder if lime green would look better. Eh, it’s not an issue and will wait until the car is completely done and sitting out in the sun. 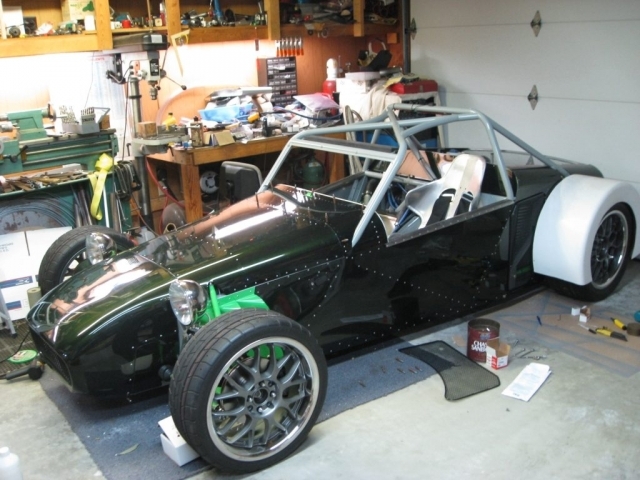 All the remaining parts to be powdercoated were delivered to the shop mid-week and they finished the green pieces Friday; the black bits will be done early this week. However, the Big News is that all exterior panels have been prepped and delivered to the paint shop, so now the waiting begins. 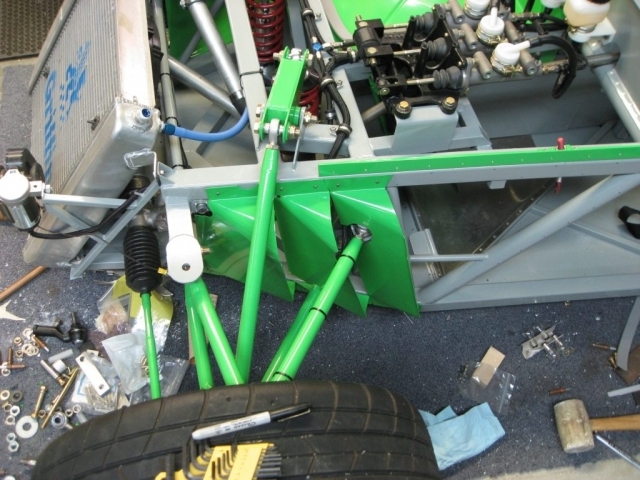 In the meantime most of the remaining green bits were installed, the radiator “gills”, steering tie-rods, and the front storage tray. (Due to the lighting, the green parts look rather pale; they look much better in the sun.) 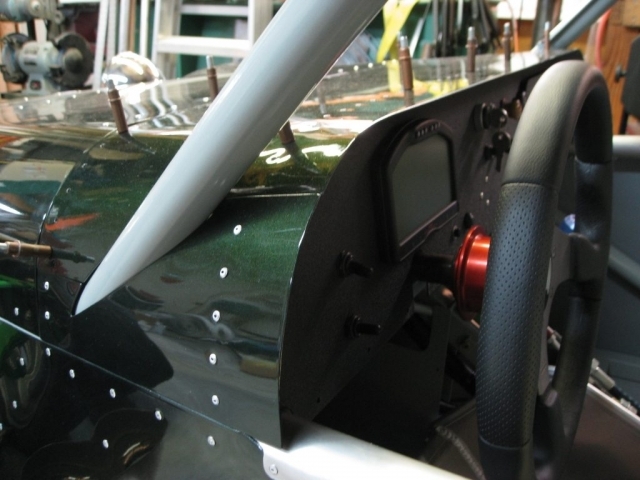 Work then stated on fitting the interior panels and seatbelts. 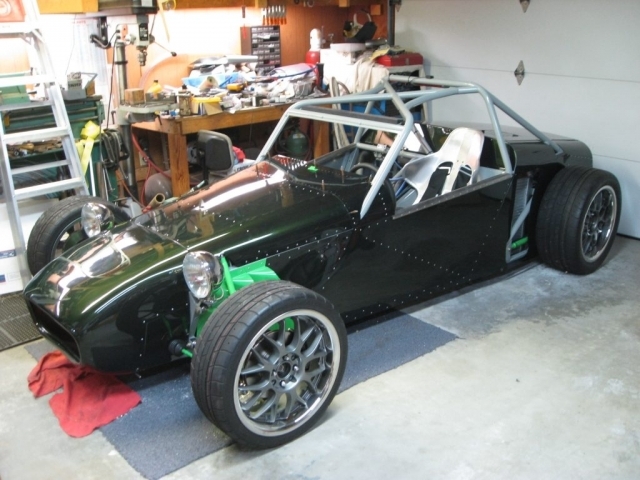 The only catch is that the fuel level sensor is behind the panels and hasn’t been scaled yet. I didn’t set “zero” before filling the tank so the sensor needs to be lifted out for that, then either filling the tank fully, or put the sensor in a column of fuel of equivalent height to mimic 100% If I did the math right it holds 14 gallons. Completion of Midlana is drawing near!